One day Paul Hambleton will inherit an empire. He’s married to the daughter of Maypole Ltd founder Stuart Howe, and he’s got big plans for the company. 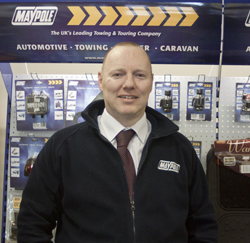 Maypole Ltd is firmly entrenched in its core business of manufacturing and supplying trailer components and towing accessories. Dealing with a core customer base of some 1500 companies, Maypole is now on a marketing push both to the trade sector and to customers. The launch of its new website should help with that, as will the built-in retailer locator: “We wanted to take the approach that if Joe Public sees our product on our website, they can then find a retailer. If you lock the website down, you restrict that. Are there big changes in the towing market? As far as Paul is concerned, they don’t come any bigger than the issue of trailer type approval: “It means that trailers have to be built to a certain standard to comply with the law. That’s caused a big shake up to the people making trailers in the UK. Maypole currently manufactures a quarter of its product portfolio in the UK, a number Paul is keen to grow: “I suppose a 50:50 split would be great, but my goal would be to grow what we’re doing in the UK and bring in new people. “Twelve months ago we weren’t doing trailer harnesses for example. We used to import them from Italy and we didn’t have any people working on them. Now we do. We want to support UK manufacturing. 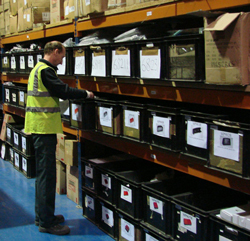 A growing UK product portfolio means Maypole is a growing company with ambitions to match. Indeed, Paul wants to see the current nine million pound turnover jump to £50 million in the next five years. “I think with towing you have to be a specialist, so you’re either a towbar manufacturer or you sell the accessories.